A Cisco survey of mobile users reveals strong desire for BYOD programs and clear productivity gains. But hold off on those BYOD mandates because the love for corporate devices hasn't burned out yet. Call it "Bring Your Own Device" version 2.0. Today, Cisco Internet Business Solutions Group released results of a BYOD survey of 2,400 mobile users across six countries and many industries, which show a fast-growing computing trend entering the next level of maturity. It's a trend driven by employees, of course, but Cisco's survey shows just how hungry people are for BYOD. Nearly half of all respondents prefer BYOD over corporate devices. As much as 29 percent of respondents prefer BYOD even though their companies don't provide corporate devices. With BYOD, people aren't just giving lip service -- they're putting money behind their words. BYOD-ers spend an average $965 purchasing their own devices for work, and an additional $734 annually on mobile voice and data plans (not including monthly reimbursement stipends). Perhaps most telling, Cisco found that the average BYOD-er would require a $2,200 signing bonus to jump to a company that doesn't support BYOD. The United States is the largest BYOD market with 71 million BYOD devices in use, reports Cisco. This figure is expected to grow to 108 million by 2016. By then, though, China will have become the leader with 166 million devices. 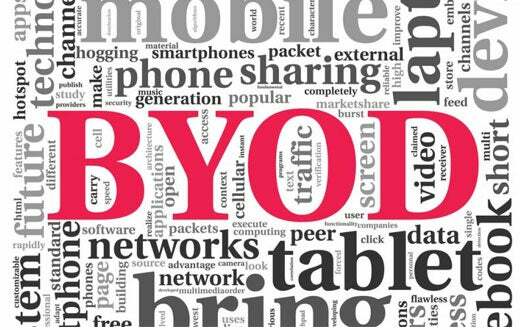 Many signs point to BYOD moving quickly. A recent Gartner survey of CIOs found that half of employers will require employees to supply their own device for work purposes by 2017. Moreover, U.S. companies are twice as likely to allow BYOD as those in Europe. Early adopters of BYOD targeted smartphones, because managing them was relatively easy given a phone's limited data capacity and functions. Then companies expanded BYOD programs to tablets. Laptops represent BYOD's Holy Grail, given that the laptop is the primary productivity tool for the majority of knowledge workers. Currently, 81 percent of BYOD-ers use smartphones, 56 percent use tablets and 37 percent use laptops, according to the Cisco survey. But BYOD laptops should be a core feature in a BYOD strategy, Cisco advises. Productivity gains from BYOD have been somewhat of a moving target, but Cisco believes it has found the right metric: work time gained from using, and setting up, your own device instead of a corporate-owned device. The thinking goes that a person works faster and more often with devices that they're familiar with, that they chose themselves, and that they use for personal reasons too. The average U.S. BYOD knowledge worker saves 81 minutes per week thanks to using their own devices, according to the Cisco survey. Across countries, the average time gain was 37 minutes. Executives save three times that amount. And then there are hyper- productive BYOD users: 36 percent overall who gain at least two hours in productivity per week by using their own devices for work, and 21 percent who gain at least four hours in productivity per week. Cisco attaches dollars to these extra minutes of work afforded by BYOD. A comprehensive, well-designed BYOD program can lead to an annual increase of $1,650 per employee. Of course, this requires that the program embraces BYOD laptops, which delivers the most bang for the buck as a productivity tool. The Cisco's survey also sheds light on a group of mobile workers who don't want to be a part of BYOD. Thirty percent of mobile users would rather use corporate-provisioned devices. Even more alarming, a quarter of current BYOD-ers would rather use corporate devices, while 15 percent of BYOD-ers are actually unproductive using their own devices. What's behind this anti-BYOD sentiment? Corporate devices, of course, come with IT support rather than the do-it-yourself nature of BYOD. Because of this, Cisco advises companies to re-think a BYOD mandate for all employees. The report concludes: "By enabling BYOD for those who want it, and providing company-owned options for those who do not, companies can help BYOD workers increase their productivity, while allowing others to work the way they are most comfortable."